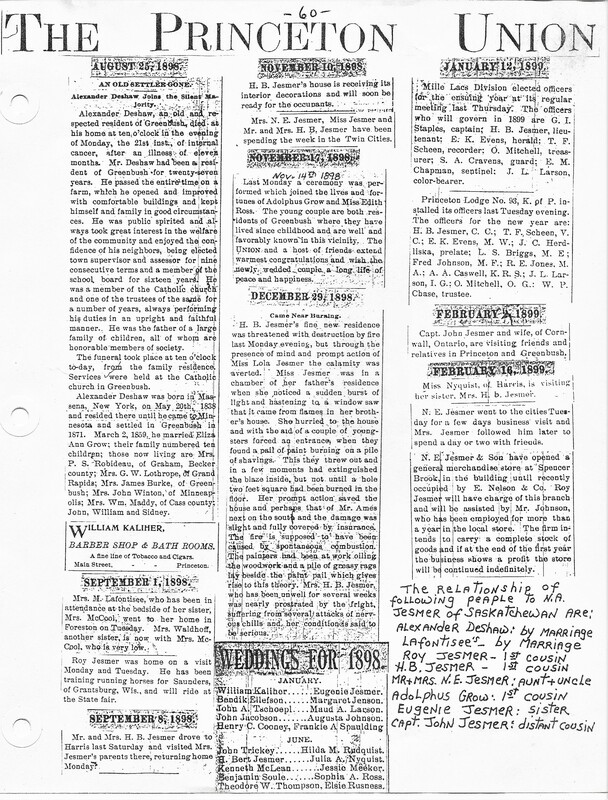 Newspaper Articles of the Jesmer Clan in 1898. In 1898 we see Nelson E. Jesmer’s son Hiram Bert Jesmer taking a role in managing the store and being a leader in the service clubs. He was building a large home next to his father. The Jesmer clan is visiting one another. Eunice Rose (Jesmer) Waldhoff is battling consumption, TB all year long. She eventually dies of it at the end of the year. Family members are reported as visiting her in North Branch Minnesota. She died at 26 years old and she had two young kids at home. Didn’t they worry about other family members getting TB? There were two wedding among the Jesmers in Princeton in this year, William Kaliher and Eugenie Jesmer – January 1898….H. Bert Jesmer and Julia A, Nyquist – June 1898. A militia was active and William Kaliher had joined it. 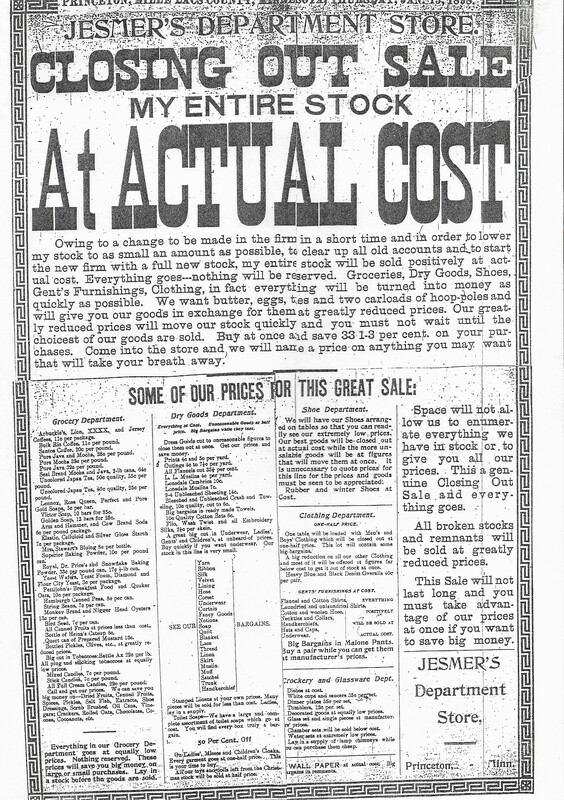 1-13-1898: Nelson E. Jesmer store is having a closing out sale because of administrative changes in the store. He is willing to trade goods for butter, eggs, ties and two car loads of hoop holes. 1-18-1898: A.D Jesmer, Brother of Joseph A. Jesmer, is thinking of running for the legislature. 2-24-1898: Nelson A. Jesmer is buying up goods for the store. 3-3-1898: Bert Jesmer, N.E. Jesmer’s son is getting involved in the Princeton business community. 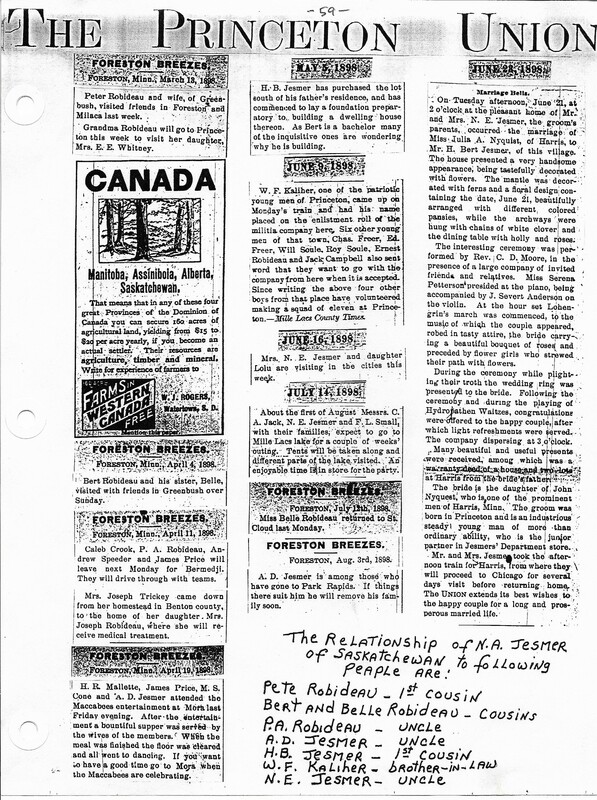 3-13-1898: Canada is inviting settlers to the prairie provinces. 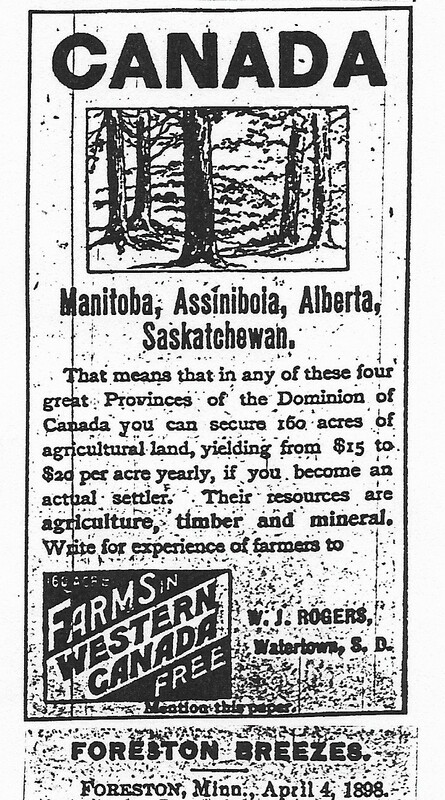 Maybe Nelson A. Jesmer became interested in Manitoba because of these advertisements. 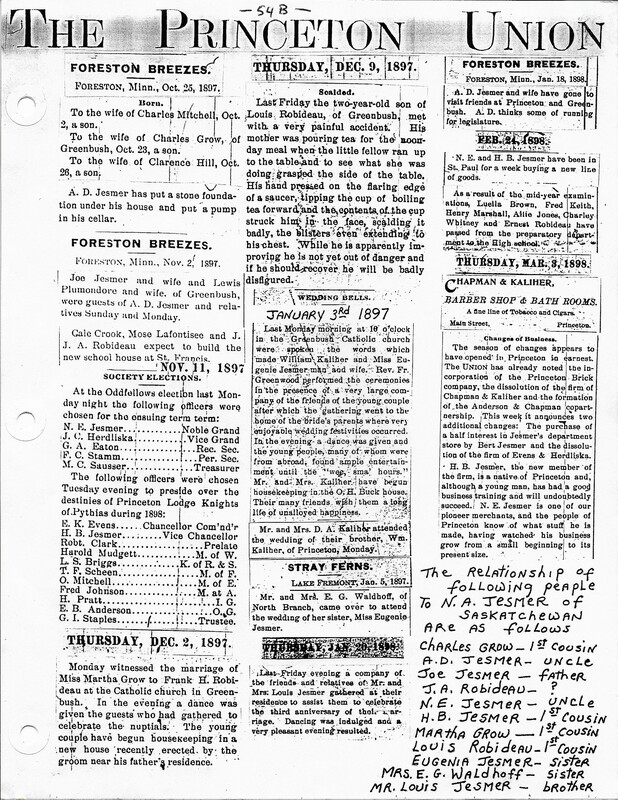 4-10-1898: A.D. Jesmer attends a night of entertainment at the Knights of the Maccabees, in Mora MN. People were very involved in various service groups. 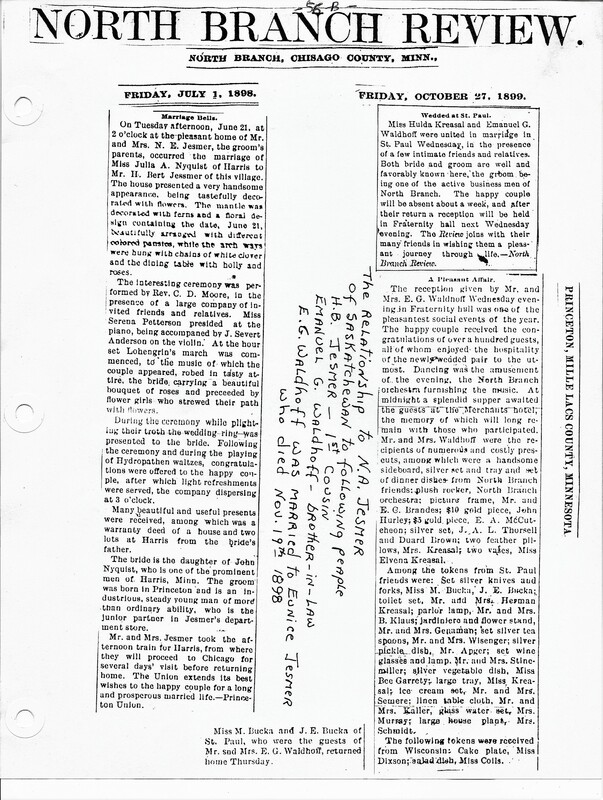 5-9-1898: W.F. Kaliher joins a local militia. He was married to Eugenia Jesmer, daughter of Joseph A. Jesmer. 6-21-1898: H. Bert Jesmer, Nelson E. Jesmer’s son, got married in the home of his father. 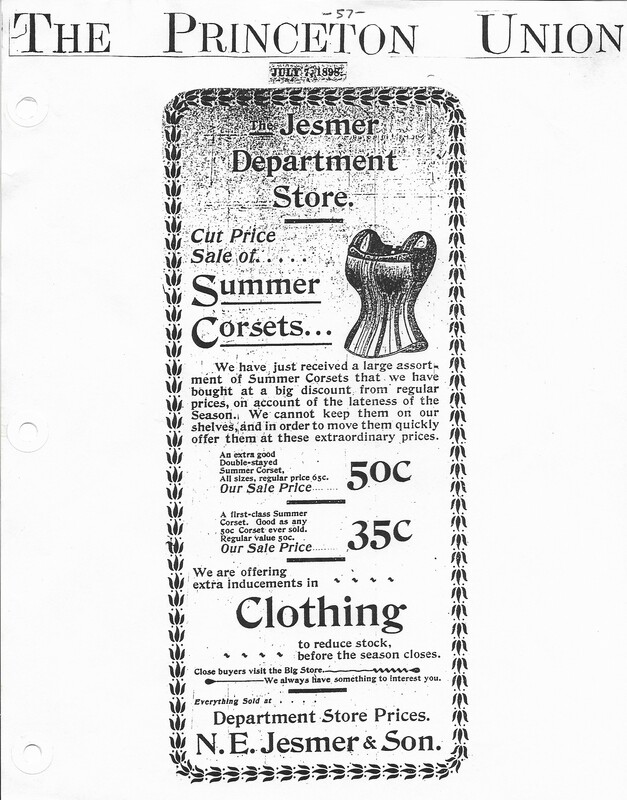 7-7-1898: Nelson E. Jesmer store selling women’s summer corsets for 50 cents. 8-3-1898: A.D. Jesmer is checking out Park Rapids as a place to live. 8-25-1898: William Kaliher owned a barbershop and bathroom. 9-8-1898: Roy Jesmer, Nelson E. Jesmer’s son is training running horses in Wisconsin, and will ride horses in the state fair. Nelson E. Jesmer and family are making frequents visits to family. He also did a camping trip to Mille Lacs lake region. Money allows one to travel a lot. 9-9-1898: Eunice Rose (Jesmer) Waldhoff was in St Paul for medical treatment. I believe that she had consumption, which is tuberculosis. Eunice Rose Jesmer [Parents] was born in <1870/1872> in Greenbush Twp, Mille Lacs, MN. She died on 19 Nov 1898 in North Branch, MN. The cause of death was Consumption. She married 1Emanuel Gustave Waldhoff on 6 Oct 1892 in Mille Lacs Co, MN. 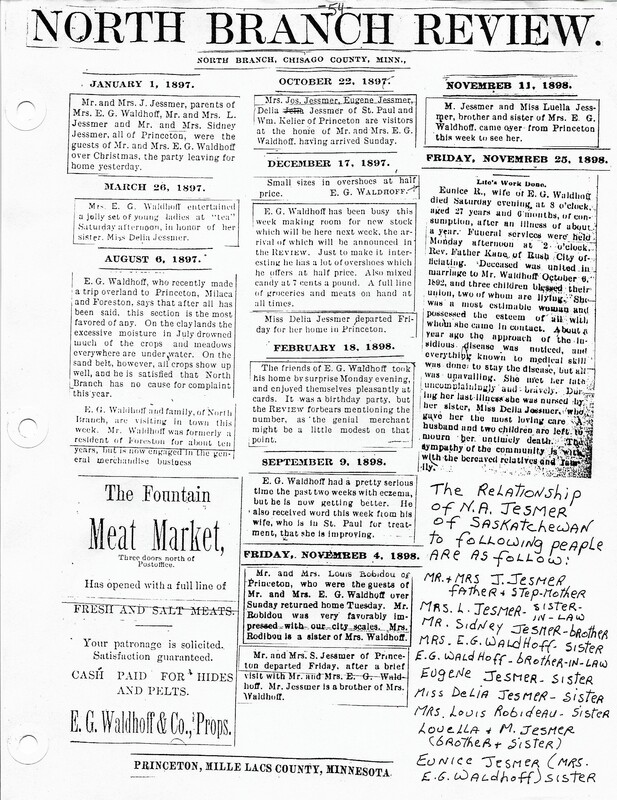 10-27-1898: Emmanuel, the widowed husband of Eunice Rose Jesmer, got remarried to Hulda Kreasal in North Branch. There doesn’t seem to be any Jesmer’s listed in the newspaper article about the wedding. 11-4-98; Family members were visiting the home of Eunice and her husband, Emanuel. He was a business man in the nearby community of North Branch. She was slowly dying of TB. Her sister, Delia Jesmer was nursing her in the last days. She had started showing symptoms of TB one year previous. 11-28-98: The funeral of Eunice Rose Jesmer. She died of TB. (Nov 19). She was about twenty-six years old and had three kids. Two of them were living at the time of her untimely death. 12-29-1898: H. Bert’s Jesmer’s grand new home almost burnt down because of painting rags spontaneously combusting. Lola, his sister saw the light from next door and with the help of friends put out the fire. 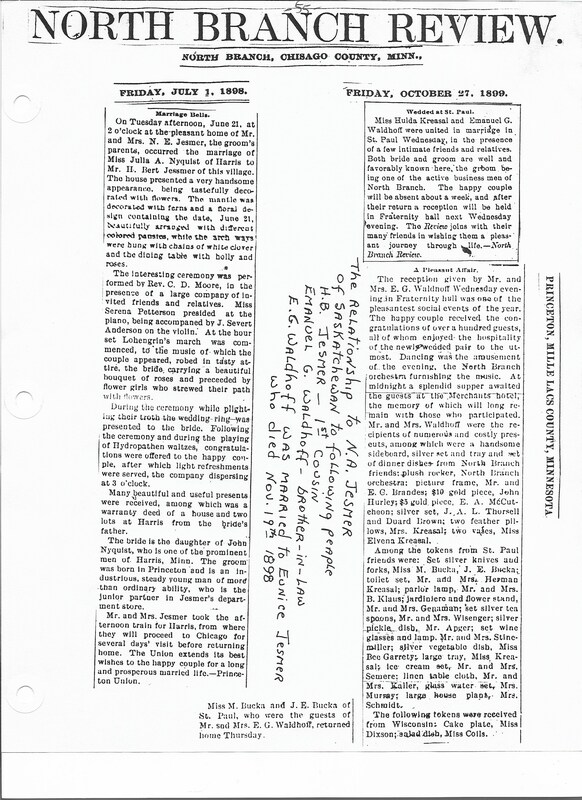 What Was Happening in Nelson Adulphus Jesmer’s Life in 1898? 1/3/1898 Sister, Eugenia, marries William Kaliher in Greenbush MN. 1/15/1898 Son, Herbert, is sick. February 15, 1898 Battleship MAINE explodes, 266 crewmen killed. The fact that Nelson was indicted on 2nd degree grand larceny charges, meant that his life in local politics was over in Hibbing. He could not continue with what had become a major passion in his life. 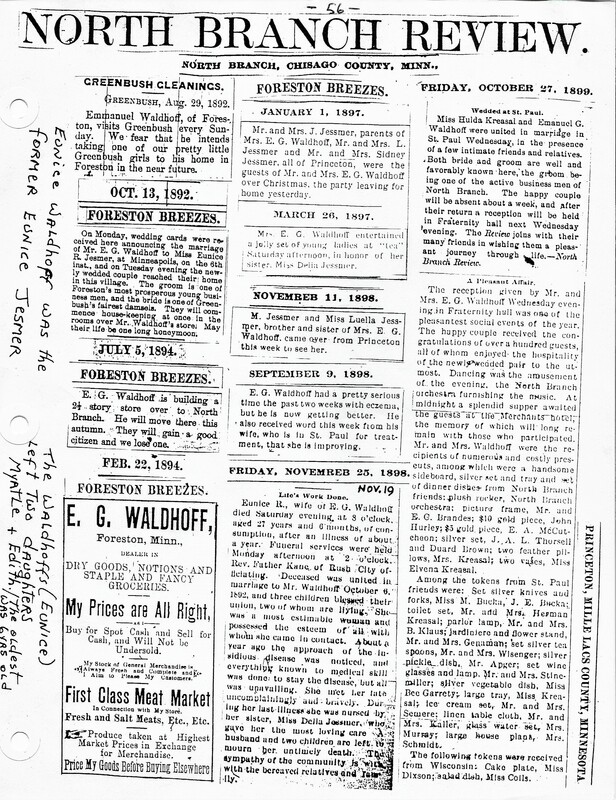 So in order to make a new beginning, the forty two year old Nelson did what he had done in the past, after five years in Hibbing he decided to pack his bags to go on ahead of his wife, Jennie, and four children, (Herbert, Ida, Carl and Harvey), to another pioneering community, Langdon North Dakota. He may have had his eye on Manitoba.